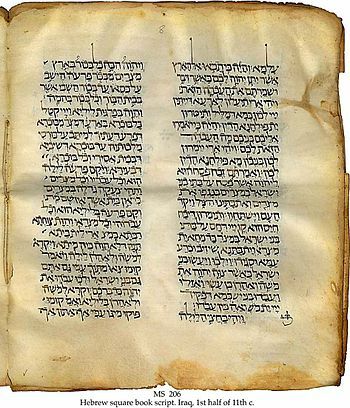 The Old Testament is a Christian name for the books of the Hebrew Bible. This is a problematic term because Jewish people could easily find it disrespectful of their holy scripture. The designation comes from a Christian perspective with the unabashed implication that the New Testament fulfils the Old Testament, rendering the latter imperfect and somewhat lacking. This way of viewing the so-called Old Testament is found within Catholic, Orthodox, Protestant and Fundamentalist forms of Christianity. In Christianity, the relationship between the Old and New Testaments seems confusing. I had one professor who argued that Christianity’s biggest mistake was to try to incorporate the Old Testament into the new religion. They should have just started afresh, he felt. I think this perspective lacks appreciation of the Jesus story. The “new” religion gains a certain depth and continuity by including the Old Testament. However, problems do arise, which theologians and preachers try to resolve in various ways. Also, the NT says we should live by the spirit of the law and not the letter of the law.² Living by the letter of the law “kills” it. The OT, by way of contrast, lays out strict and fairly detailed laws as to how the righteous should behave. This difference in rules and regulations also applies to what and when we eat. Somehow the Catholic Church forgot this, and started making new rules of regulations about eating. But many modern Catholics see this as unimportant. A representation of Saint John the Evangelist in Saint Patrick’s Cathedral on Fifth Avenue on July 31, 2010 in New York City. Some Christians make no apology for calling the Old Testament the Old Testament. For them, it’s just another instance of unwarranted political correctness to pretend that all religions are of equal value. The New Testament, again for them, is better. So why, they argue, water things down by pretending otherwise? But again, their Holy Bibles contain the Old Testament. So there’s a lot of room for debate here. ¹ Both the OT and NT, however, are sexist and often simplistic—especially in the NT with regard to nutritional needs. ² These are just some of the differences that came to mind while revising this entry; this is not an exhaustive list. The NT also emphasizes forgiveness while the OT prescribes the famous, “an eye for an eye, a tooth for a tooth” kind of reactive punishment for wrongdoings. Follow this link for more perspectives. The proof of a religion is established in miracles…..